Overview - A snubbed malevolent fairy casts a curse on a princess that only a prince can break, with the help of three good fairies. I'm sure I'm not the first to make the observation that the villains of Disney's animated features are often more interesting than their heroes (and heroines). Think Cruella de Vil in '101 Dalmatians,' the Wicked Witch of 'Snow White,' or the Beast of 'Beauty and the Beast,' and it's easy to savor all of the cruel wickedness far more than the blandly-vanilla sweetness. Nowhere may this be more true than with 'Sleeping Beauty,' a perfectly fine fable in the Disney canon, but one where its titular Princess Aurora and her romantic melodrama are overshadowed by the vividly drawn supporting characters, and particularly the delightfully-demonic Maleficent. That doesn't make 'Sleeping Beauty' a bad film at all, but it's one where all of the story and character elements are certainly not created equal, and furthermore, take a back seat to Disney's technical artistry. 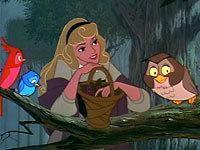 By now the story of 'Sleeping Beauty' is known by just about anyone who ever had a fairy tale read to them as a child. Based on the first section of Charles Perrault's short story "La Belle au Bois Dormant" (published as part of Perrault's 1697 book "The Tales of My Mother Goose"), it's only fair to Disney to say the source material is slim at best. Culled from a mere four paragraphs from Perrault, the tale is quite straightforward and simplistic. Running a scant 75 minutes, the film oddly short-thrifts its main human characters (who are generic at best). The villain, Maleficent, energizes the film, and even the animal characters seem more, well, animated. The real beauty of 'Beauty,' then, is in the details -- it's supporting characters, its wondrous visual acumen, its memorable songs and its beautifully-rendered animation. If not exactly a failure as a story, 'Sleeping Beauty' is nonetheless remembered as much, if not more, for its sights and sounds. 'Sleeping Beauty' was produced at a crucial period in American cinema, as television was sweeping the nation and moviegoers were rapidly abandoning the theater seats for the comfort of their couches. Like all of the major studios at the time, Walt Disney was looking for something new to attract its dwindling audiences. 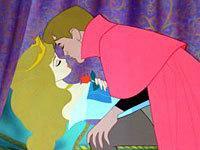 'Sleeping Beauty' was the first Disney feature to adopt many technological advances of the time, including 70mm (dubbed Technirama) and six-track audio. The film is also a widescreen beauty, composed in 2.55:1, and produced in three-strip Technicolor. It is also the last hand-drawn Disney feature to be inked entirely by human hands. The result is that despite narrative weaknesses there is much to savor in 'Sleeping Beauty.' The film is absolutely and undeniably beautiful -- it's animation is as splendid as any of the unquestionable classics in the Disney pantheon, including 'Snow White,' 'Cinderella' and 'Bambi.' Marking a further creative departure from past Disney features, 'Sleeping Beauty' has a more arch and defined visual style. (Next to the Barbie-like Aurora and angular evil of Maleficent, the plump Snow White seems positively cherubic by comparison.) The color palette, too, is darker and more foreboding. The forest is teeming with menace, thanks to the use of rich, deep purples, green, and reds that are gorgeously realized. The contrast with the far more cheery world of Aurora is also thematically ripe, adding a suggestion of complexity to a story that is greatly in need of depth. With its action and intensity, 'Sleeping Beauty' is also more aggressive than some previous Disney features. The climactic battle to lift the curse that imprisons the slumbering Aurora, between Prince Philip and a dragon-ized Maleficent, is quite suspenseful and visceral, enough that I'm sure it has scared the bejesuses out of many small children over the years. The reign of misery that Maleficent and her shadow self/raven Diablo cast upon the kingdom is also no child's play. There is a heft to the darkness in 'Sleeping Beauty' that further helps to off-set the cliched and conventional aspects of its romantic confections. There has been some debate among diehard Disney fans as to the studio's choice to bring 'Sleeping Beauty' to Blu-ray as its first Platinum Series high-def release. Though I still enjoy 'Sleeping Beauty,' it's true that it is perhaps not as cohesive and wholly-realized a vision -- in character, story and visuals -- as say 'Snow White' or 'Beauty & the Beast.' But it still ranks as a truly fine achievement for Disney, and easily holds its own as a classic. It's a wholly respectable and welcome launch title for Disney's Platinum line, and judging by how terrific this disc looks and sounds (not to mention the copious extras), there is only better yet to come. Disney's kick-off Platinum Series Blu-ray title 'Sleeping Beauty' has received a wonderful restoration, with this 1080p/AVC MPEG-4 encode offering a beautiful transfer (it is also -- at last -- framed at 2.55:1, showing more area at the top/bottom and sides of the picture than ever seen before). According to Disney's provided press materials, 'Sleeping Beauty' has undergone a meticulous frame-by-frame clean-up, culled from the original nitrate negative and requiring years to complete. The result is clearly superior to any video (or theatrical, for that matter) presentation seen before. If this is indicative of Disney's future Platinum Series presentations, fans are in for a treat. The source is just about impeccable, with no traces of dirt or blemishes. Blacks are pure, with little of the print fluctuations that usually plague material of this vintage. Contrast is vibrant but retains a film-like look, and there is no faux-digitization of the image. The originally, already-brilliant Technicolor palette is superior and, in some cases, greatly improved over the previous DVD version. Darker scenes, such as nighttime forest scenes and those with Maleficent boast much cleaner and deeper purples, reds and blues. And thanks to the wonders of digital technology, the often disastrous misalignment of three-plate Technicolor is absent here, so the image is always uniform. Detail and sharpness also receive a noticeable boost. The image is three-dimensional, with appreciable depth and excellent clarity even in the most detailed shots. Shadow delineation sees a jump over the DVD, such as fine textures of Aurora's clothing or minor details in background plates which are now clearly visible rather than vague mush. It's also no surprise that this is a rock-solid encode, with no apparent edge enhancement or motion artifacts. Are there nitpicks? A couple. The opening minutes made me a bit nervous, as there was some minor print wavering, but it quickly subsides. There is also the sporadic soft shot throughout, but this minor inconsistency in sharpness appears more indicative of the source than a fault of the transfer. Such quibbles aside, 'Sleeping Beauty' is a gem. 'Sleeping Beauty' has been expanded nicely to 7.1. The rear soundstage is nice and full, with the original sound stems utilized to create truly discrete effects that pan smoothly between channels. I did not notice any great exploitation of the two extra surround channels, but certainly the surrounds are full and alive with sound. Minor ambiance is also nicely sustained, particularly during the outdoor and action-y moments. Clarity and depth to dynamic range is full-bodied, with the elements betraying their nearly 50-year age. Low bass is also deep and tight, but not overpowering. The score is also technically impeccable, with a richness I wasn't expecting for an older title. All that could be considered slightly lacking is dialogue reproduction. Spoken words are no doubt clean and pronounced, but they sometimes sound a tad thin in the high-range, and not as natural as the effects. But no matter. As with the video, Disney has more than earned the Platinum designation with this DTS HD Master Audio 7.1 upgrade. Short Film: 'Grand Canyon' (HD, 29 minutes) - A highlight of the extras, Disc One kicks off with this adjunct pre-feature short shown during 'Sleeping Beauty's original theatrical run. With a bit of a 'Fantasia' vibe, this nearly 30-minute animated exploration through the national landmark is set to the music of Ferde Grofe's "Grand Canyon Suite." Big kudos to Disney for presenting 'Grand Canyon' in full 1080p/AVC MPEG-4 video (2.40:1) and 7.1 Surround. It looks and sounds great. Trivia Track - Next we have a nice pop-up fact track, dubbed "Princess Fun Facts." It has little graphic overlays providing basic if thorough info on 'Sleeping Beauty.' Touched upon are Walt Disney's original concepts for the film, standard production and voice talent tidbits, and some detail on the film's reception. A perfectly pleasant trivia track. Disney Song Selection - Essentially a chapter search, this takes you to the featured songs in the movie. The only value-add is that lyrics accompany the scenes, in case you want to sing along. Audio Commentary - Finally, there is an audio commentary on disc one. However, since it is also integrated into the Blu-ray exclusive "Cine-Explore" mode, I will discuss it in the HD Bonus Content section (see below). Documentary: "Picture Perfect: The Making of Sleeping Beauty" (HD, 44 minutes) - The centerpiece making-of, this fresh doc mixes newly-discovered production footage, vintage interview material with Walt Disney, and new chats with Disney historians, animators and industry luminaries (among them Pixar's John Lasseter). It nicely encapsulates the production troubles that befell 'Sleeping Beauty,' which at the time represented a considerable cost investment for Disney, as well as a shift in the studio's animation techniques (among them being the fact that this was their last hand-inked feature). Kudos to Disney for not white-washing the story (details of wild cost overruns and internal politics are not discarded), which makes for fascinating viewing. Next is "Four Artists Paint One Tree" (16 minutes), which features Earle as well as other Disney artists whose work contributed to the film and bucked many of the previously-held stylistic conventions of past Disney animated features. Finally, "Sequence 8" (6 minutes) documents the now-infamous 8-minute forest sequence in the film, which went wildly over-budget during the original production and eventually caused an animator demotion and several heads to roll at Disney. Deleted Scenes (HD) - All are musical numbers: there's an Alternate Opening Number (that includes an entirely different song and character than seen in the finished product, as well as three deleted sequences: "It Happens I Have A Picture," "Riddle Diddle," and "Go To Sleep." Disney Walkthrough Attraction (HD) - Two conjoined-twin features, there is a CGI recreation of the now-closed "Original Sleeping Beauty Castle Walkthrough Attraction" at Disneyland, as well as a short companion featurette on the history of the ride, "History of the Sleeping Beauty Castle Walkthrough Attraction" (10 minutes). Still Galleries (HD) - Typical of Disney Platinum releases, it's as if the studio raided the vaults for every last image of 'Sleeping Beauty' that ever existed. There are literally hundreds of photos here, nicely laid out for 16:9 HD screens. They are divided into eight categories: "Visual Development," "Character Design," "Backgrounds," "The Sleeping Beauty Storybook," "Storyboard Art," "Live-Action Reference," "Production Pictures" and "Publicity." Storyboard Sequences (HD) - Carried over from the previous DVD are a pair of rough storyboard sequences: "The Fairies Put The Castle To Sleep" and "The Capture Of The Prince." Both are the only extras here presented in 480i/MPEG-2 video only. Interactive Games (HD) - There are a trio of activities: "Enchanted Dance Game" and "Fun with Language Game." All are pretty basic, including a memory game, dance instructional, and a simple vocabulary primer. These are for the very young set only. Theatrical Trailers (SD) - Finally, we have a theatrical teaser trailer, theatrical trailer, and theatrical re-release trailer for 'Sleeping Beauty.' All are in standard-def only. DVD Copy - Wait, there's more. Disney also provides a standard DVD copy of the film on a third DVD-9 disc. It includes the film in anamorphic 2.55:1 widescreen, with English, French and Spanish Dolby Digital 5.1 Surround and subtitle options. 'Sleeping Beauty' may not be one of Disney's absolute best animated features, such as 'Snow White' or 'Beauty & the Beast,' but it remains a classic. Both as story and as animation, this is a pivotal film in the Disney canon and certainly deserves the Platinum Series treatment. The studio has delivered on all fronts, with painstakingly restored video and audio and hours of bonus materials and exclusives. 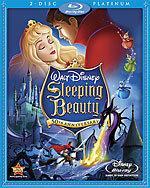 The Blu-ray of 'Sleeping Beauty' is a must-have for any serious fan of Disney animated magic.